As of this moment, Bitcoin has plunged about 10% from its recent plateau of about $600 per coin to about $550. Much of the drop was in the past 12 hours, though the price had been sinking in the past week or so. Aside from increased talk of a "Bitlicensing" scheme by the government of New York, there is no clear news triggering the sell-off. To be honest, it's been harder for me to call price movements this year than last, because of new factors in 2014. Neptune has been hovering near progressed Venus, and Saturn spent much of this year square progressed Venus: these may have indicated/caused price depression and/or stifled price movement. Nevertheless, the transits and progressions for today suggest a number of reasons why the price would be low. Transiting Neptune tightly conjunct progressed Venus: Loss (Neptune) of value (Venus). This peaks in about two weeks. Transiting Jupiter approaching exact conjunction with Bitcoin South Node: Bad (South Node) news/publicity (Jupiter). This peaks in just over two weeks. Transiting South Node approaching exact conjunction with Bitcoin MC: Decrease (South Node) of authority/prominence (MC)? This peaks in early December. I make no guarantees about my astrologically-fueled guesses and do not offer advice, but personally I'm holding for now, and planning to buy in two weeks or so and in December. 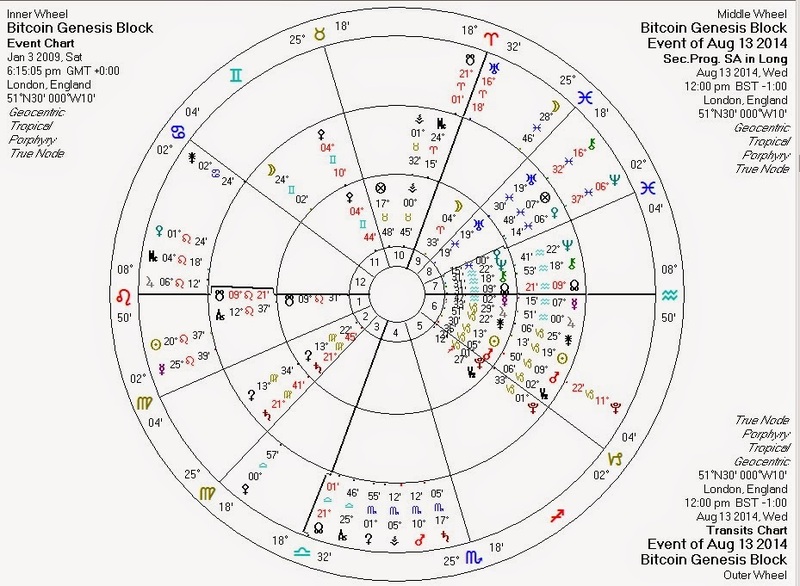 In January transiting Pluto forms another conjunction with the Bitcoin Sun -- I consider this to be a temporal center for potentially extreme price activity, and sometimes the activity starts a couple of months in advance of the exact conjunction. Whether up or down (or both) I am not certain: I think there's a chance of seeing a new all-time high, or a catastrophic price implosion. August 14, 2014 at 10:15 AM Note: the transiting lunar nodes have just passed the exact square with the lunar nodes on Bitcoin's first solar return. A possible trigger?